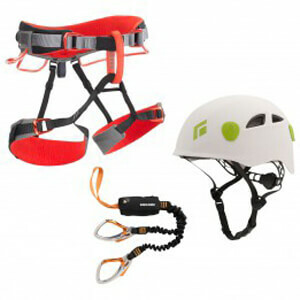 Looking for via ferrata sets? Check out our Buyers Guide! The essentials for via ferrata are a helmet, a harness and a via ferrata kit. The latter catches the climber in the event of a fall. The via ferrata set forms the connection between the climber and the steel cable attached to the rock. However, when it comes to via ferrata, rule number one is to try and avoid falling in the first place. That's the difference between via ferrata (even with the best via ferrata kit) and sport climbing, where falls are expected. What do I need a via ferrata kit for? A via ferrata is a rocky passage prepared with permanently installed wire ropes and iron hooks so that it can be climbed without the expertise and the equipment that would normally be needed for alpine climbing. Put your helmet and harness on, clip in your via ferrata set and of you go. Is that all there is to it? No, that would be reckless and dangerous. Personal skills are also important. A good level of physical fitness and knowledge of mountainous hazards. Less experienced alpine tourists in particular tend to be fans of via ferrata. It allows them to take on challenging rocky passages and enjoy the best views! What does a via ferrata kit with a lanyard look like? Current via ferrata sets are Y-shaped. There is a sling at the bottom that the climber attaches to his harness. The Y-foot contains the impact force absorber, either a rope brake or a shock absorber system. This is where the arms of the Y connect, two ropes or slings with via ferrata carabiners at the ends. When on the via ferrata the climber is attached to the permanently installed steel rope via both carabiners. In this way the via ferrata kit prevents a trip from turning into a fall. It also ensures that the climber is secured even when changing over the carabiners.